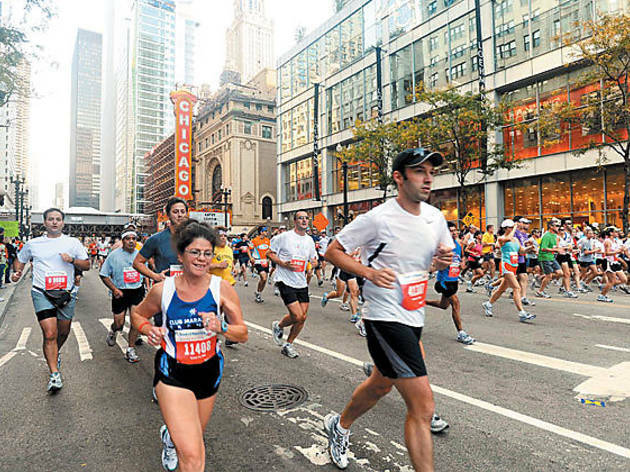 More than 40,000 runners run the Bank of America Chicago Marathon; here are tips on how to find your friend. 1. Use a homing device Go to chicagomarathon.com and sign up for runner tracking. You’ll get messages via text message, Twitter or Facebook when your runner passes checkpoints: the start line, half marathon and various other milemarkers along the way. Each text also displays the runner’s average pace up to that point—info you can use to better calculate when he will reach you. 2. Know your runner’s predicted pace Runner tracking can go on the fritz on race day—whether your cell has bad service or there’s a glitch in the technology. (One year, I received text updates for friends more than 12 hours after the race was over…helpful!) So find out what pace your pal expects to run and then calculate what time she should pass your cheering spot. This is no time for modesty. For example, if she says she’ll run 9-minute miles but she really plans to run 8s, your window for spotting her at the halfway point would move up by almost 15 minutes. 3. Pick a viewing spot in advance Don’t wait until you roll out of bed Sunday morning to decide where you feel like standing along the course. Choose a spot in advance and tell your runner exactly where you’ll be. Must-share info: The intersection, mile, even the side of the street you’ll hang out on—so they can align themselves on that side of the pack. It’s much easier for a runner to find you than vice versa. 4. Find out what your runner is wearing Even if you’re looking for your twin brother in the crowd, you won’t spot him unless you know exactly what he’s wearing. And hopefully he’s wearing something other than black shorts and a white shirt, because that’s the outfit 44,000 of the 45,000 runners will don on race day (or at least that’s what it will feel like). Runners wearing colorful hats and tops are easier to spot in the crowd. 5. Decorate yourself Tell your runner what you’ll be wearing, too. Some folks will hold balloons or large signs to stand out from the crowd of spectators, and that’s very cute and helpful, but something as simple as wearing a colorful hat can be enough to ensure you connect. 7. Never lose hope As minutes go by, you may become more and more certain that—gosh darnit—you totally missed your friend and she’s already fist-pumping at the finish line. The reality: She probably hasn’t passed you. She could be running slower than she hoped (especially if it’s a warm or windy day), or she may be on pace but just began a little late after getting stuck at the back of a start-line corral. Don’t give up—continue scanning the masses!